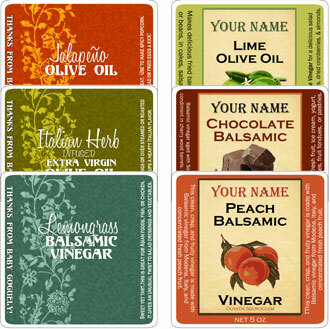 The Olive Oil Source, the industry leader in olive oil-related products, is pleased to announce a new Premium Label design service that provides wholesale, retail and special event customers like brides and non-profit groups an opportunity to create one-of-a-kind labels for their individual needs with the hands-on support of an experienced label design specialist. 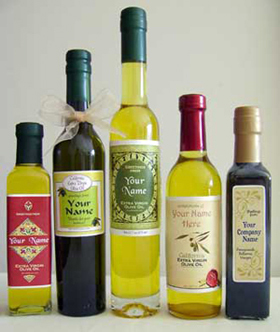 For customers interested in purchasing Shiners (unbranded bottled olive oils and vinegars) to use with their customized labels, the minimum requirement has been lowered to 3 cases to accommodate varying quantity needs. Custom labeled products have become the ideal way to extend brand identity for resellers and retailers or to mark a special event or fundraiser by providing a memorable premium to customers and guests. The Olive Oil Source launched this new Premium Label service to answer the need for the managed design and development of custom labels. Managed by Susan Sullivan, a design specialist with years of experience serving wholesale and retail clients, the service offers three distinct levels of support to match the varying needs of customers. Choose a Premium Label Design from a wide array of styles and sizes and work with a designer to customize it to your liking by adding personalized text and changing background color and font. Labels are available in a variety of shapes and sizes to fit the bottle of your choice. Minimum order is 6 label sheets. Premium Labels are exempt from the minimum purchase of $200 in The Olive Oil Source Wholesale Store. Choose a Premium Label Design from a wide array of styles and sizes and work with a designer to customize it by adding photos or logo artwork to create a signature image, personalized text, background color and font. Labels are available in a variety of shapes and sizes to fit the bottle of your choice. Minimum order is 6 label sheets. Premium Labels are exempt from the minimum purchase of $200 in The Olive Oil Source Wholesale Store. Our designer works with you to create a completely customized label that is uniquely yours. This option provides the greatest amount of design flexibility and opportunity to showcase your brand identity and tell your own story. Labels are available in a variety of shapes and sizes to fit the bottle of your choice. Minimum order is 6 label sheets. Premium Labels are exempt from the minimum purchase of $200 in The Olive Oil Source Wholesale Store. “Many customers want the hands-on advice and assistance that only a highly knowledgeable label designer can provide. Susan Sullivan, our Premium Label Design Specialist has years of experience in product packaging and design. From corporate and non-profit organizations to brides-to-be and new parents, Susan’s skills managing the design and development process make custom labels an easy option for busy customers,” said Antoinette Addison, Vice President, The Olive Oil Source. The new service is the latest addition to a full range of olive oil-related products and services from The Olive Oil Source, including a full range of more than 115 blends and flavors of high quality, authentic olive oil and vinegar and a full line of lifestyle products for the home. Since 1998, our company has been internationally recognized as the premiere source for the highest quality products in the olive oil industry.